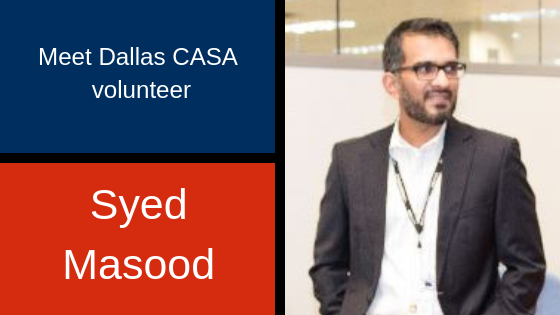 Child advocate Syed Masood was recently honored by his employer American Airlines with the Earl G. Graves Award for Leadership in Diversity and Inclusion for his service in the community. Syed says the award serves as inspiration and encouragement to continue this work and find new resources in the community to reach more lives in need of help. Syed has been a child advocate since 2016. Do you have one moment that showed you the true value of a CASA volunteer? When I was standing in front of the judge and gave my recommendation for my CASA child and represented his best interest in the court – that was the moment I felt the true value of CASA. I literally felt like a super hero standing up for one of the most vulnerable members of our community and protecting his interests. Your first case recently ended with an adoption. What’s going to stick with you about this case? What did you learn? Although the foster care system in our country is not perfect, there are so many amazing and kind people in our community who are devoted to improving it and making it a safe haven for all our kids. There is always hope for change. What brought you to Dallas CASA initially? My first exposure to the foster care system was in 2012 when I worked with a woman trying to regain custody of her five children. This journey taught me how great the need is and how much I as an individual can contribute. What do you tell friends who say being a CASA volunteer is too hard or demanding? Has being a CASA volunteer changed you? I’ve become a lifetime supporter of CASA and more sensitive to the needs of others who cannot help themselves. My faith emphasis has been to be a social activist and a catalyst for change. This experience taught me how big of a difference you make in a child’s life, which will impact them for life.